We are so excited today to have an authentic emcee coming out of Nashville, TN by the name Iam_Phi. 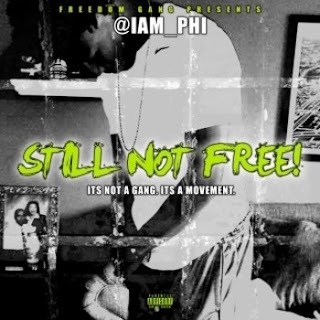 Iam_Phi is looking to strike a nerve in the digital world with the release of two singles “Still Not Free” and “Lie To Me.” We got to chat with him about Thanksgiving, his music making process, other Nashville artists he respects, and so much more! Stoli: Where are we talking from today and are you excited for Thanksgiving next week? Nashville TN yes I am. Stoli: How does your family celebrate the holidays and what makes a family special to you? Well most of my family past so I won’t be celebrating unfortunately. Stoli: Offer us a brief history of how your passion for music became Iam_Phi? Lost my sports scholarships football basketball and track getting put out of school, went to jail twice being in the streets so I turned to music. Stoli: Coming up how much were you exposed to music through your home and amongst friends/family? All the time that’s all my mother did was listen to music an sing. Stoli: Nashville has a rich history in music like country & hip hop. Who are 2 artists that you respect and listen to? Kings of Leon and starlito. Stoli: I am really concerned that Spotify & streaming will make it hard to earn $$ through recorded music. How do you see this? It’s more ways to make money in this business so I don’t see it affecting the plans we have in motion. Stoli: When you are going to create new music who do you work with and what kind of environment and mood are you in? Mostly I work alone with my little brother he is not only my manager but also my engineer I don’t need a certain space or place to create I just create. Stoli: You have 2 new singles “Still Not Free” and “Lie To Me” that you are putting out. How do you choose these songs and when did you write &amp; record them? They were written and recorded a few months ago but I felt still not free is needed in America today so that’s my way of giving back and lie to me is about a female so I guess I was in my feelings. Stoli: I love “Still Not Free.” What does that song mean to you and if you were to do a music video what would that look like visually? Due to all the police killing our people putting out the truth and waking up our people.. probably would look like a protest of human rights etc that us as a whole weren’t and aren’t allowed. Stoli: For me, my children inspire me to strive for success, what or who inspires you? Stoli: When you are not making music, what else do you attend to? My kids and doing anything dealing with getting me out. Stoli: What is coming up for Iam_Phi and where you @ online?